More progress to report on! I've now completed all three Thanatars, having weathered and detailed appropriately - so they all nicely match everything I've painted previously. I've based them all in the same style too, so they are all ready for the table-top. Whilst finishing the orange, I've also highlighted Scoria to finish him also! Edited by Chaeron, 02 April 2018 - 05:03 PM. "Our fathers were our models for God. If our fathers bailed, what does that tell you about God"
Good job. I'm impressed how detailed the painting is done. That is an intimidating amount of resin in those tubs. Nice work on the Thanatars, they look like they would be pretty scary to face. Edited by Flame Boy, 02 February 2017 - 02:46 PM.
. . . I just can't keep up with you anymore, Chaeron. So many models completed to that awesome standard, and yet you have TUBS more of them in the wings. How in the Omnissiah's name do you stay so motivated??? I don't know, but it's inspiring, isn't it? I think it's making me paint faster because I feel obligated to keep up. I'm looking forward to seeing some of those Krios Venators completed. I don't think I've seen any completed other than the Forge World models. Thanks WarriorFish! I think it was worthwhile doing the cables in a variety of colours to help break up the orange, and very happy with the blue - so thank you! Thanks Bjorn - I've really enjoyed going the extra mile on these - and hopefully can keep on improving! Cheers Flame Boy - the good news is, the resin has taken form - so I now just need to get spraying and then on to painting them! I'm looking forward to using the Thanatars as I really like the models! Both much appreciated: likewise, brilliant to see how everyone else is progressing with their various Mech armies and using that as inspiration! Looking forward to starting getting some paint on these soon! Edited by Chaeron, 02 April 2018 - 05:04 PM. I think we look forward to it even more! Keep up the good work this is a great WIP topic I wish I could update mine so regularly! Hey, drone things. Those are gonna look SWEET in the "rusty orange"! Cheers WarriorFish - I don't know about that! It's nice to be basically now rounding off units so I can get playing - so I'm sure my productivity will slow after this! Ahh, fellow Orange Cult, my Like Button is broken for some reason but wanted to say super awesome set. Thanks Kilofix: your Ryza army has definitely been a great source of inspiration to me, so that means a lot! A quick progress photo: I've now sprayed the Vulturax and Venators with Leadbelcher, and will hopefully start blocking colours on them soon. The Thralls have got their main base colour (yellow!) on, and I've done each of their left arms in a flesh tone, as well as the underlayer for the base. I'm now working through getting the metals done on all of them as part of a batch, so hopefully I can move those forward relatively quickly. Lovely models, so much detail! Nice. 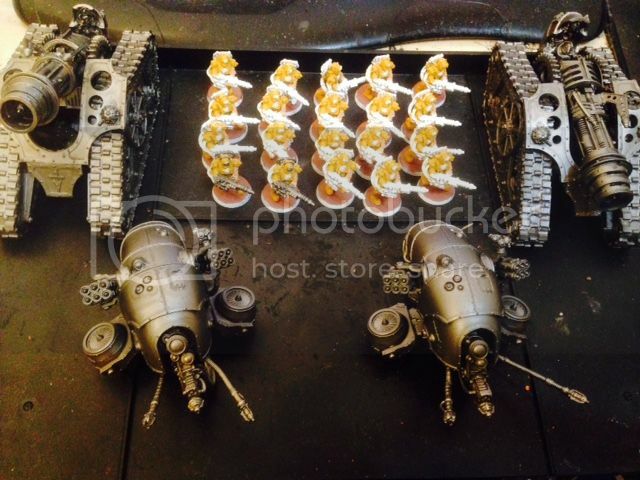 Are you running a Cybernetica Detachment for 30K with the 3 Thanatar, 2 Venators, 2 Vulturax? It leaves me with about 40 points, on which I normally go for Melta Bombs on the Thallax. I've bulked on Thallax for scoring, and because I'm yet to add more Castellax. Any list advice is gratefully received! Edited by Chaeron, 21 February 2017 - 11:50 AM. So cool! I don't know how you can do so much batch painting at once, but it's frankly still impressive every time I see it. For me, my limit is 10 infantry at once and I still struggle to get that done within 3-4 weeks! Can't wait to see paint on those Venators, though . . .
More progress! I confess, I've lavished lots of time and effort on these Thralls, as I think they'll probably be quite significant in actual game terms, and I relished the chance to do lots of different coloured cables and really pick out the detail. I'm really happy with how the yellow has turned out, and I think it complements the orange elements of the force nicely: the intention was that they were in hazard suits given their exposure to rad weaponry, and having lots of colour contrasts will hopefully make them stand-out yet more! I'll still need to drybrush the bases and to tidy up around the edges/lips accordingly, and they'll all have some machine debris added too. I started the bases of both Vulturax at the same time as the Thralls when using the Ironearth, and they'll need the same treatment to help finish them off. I'll hopefully update this with photographic progress of both Venators and Vulturax soon: I've blocked out the main parts in orange, so it'll mostly be working through my usual stepped approach with that, before moving on to detailing, weathering, etc. Edited by Chaeron, 02 April 2018 - 05:05 PM. You've got a lovely army building up (quite quickly too). Have to admit I initially clicked because of the brilliant title though. I love the thralls! In that colour they remind me of crash test dummies, which considering how expendable they are supposed to be, I think that's fairly appropriate. Again, some nice metallic colours in there. Would you be able to post a few close up photographs please? It can be hard to make out details in the big group shots. Thanks Mirbeau! The title always makes me laugh, so I'm glad you liked it! Cheers Flame Boy! That's definitely the sort of thing I'm channelling: I anticipate I'll probably need to invest in another forty in time, so will look forward to doing them in a similar style. I've just been drybrushing the bases and tidying up a few issues: I'll need to re-do some of the lips of the bases in black, as well as small amounts of Ironearth when I put in the debris (and to cover where I've overlapped colours), but they're shaping up nicely. As requested, more than happy to provide a couple of close-ups! It's been really useful to look at these close-up photos, both as a reminder of what I need to fix in terms of minor mistakes, and to give a bit more perspective of the model on the whole. It is making me thing about the bits I'm going to add to the bases, as well as a few small additions I may make (potentially to their backpacks/weaponry), just to add a bit more depth - I'm thinking of utilising Sycorax Bronze as normal on both, which I hope will just help break up the metal yet further. We are getting towards them being finished! Edited by Chaeron, 02 April 2018 - 05:06 PM. Oh nice! The dusty residue on the lower legs and feet looks awesome. They have a nice grimy look to them and I can see the neat details a lot better now. The red eyes on the Mechanicum symbol is a nice touch. I can see that they are neatly painted to look weathered if that makes sense. How do Tech Thralls fare against Skitarii from a combat point of view? I'm not very familiar with 30k rules. I would imagine Vanguard's rate of fire and accuracy would be tough to beat? Thanks so much Flame Boy! Neatly painted to look weathered is definitely something I can be pleased with! Tech Thralls are basically ultra expendable: you're basically looking at something to hold objectives or tar-pit units, whilst being very cheap. Very different proposition to a standard Skitarii - but equally, do have different roles on the battlefield! Will look to grab some close-up pictures in the next few days, just to show off the final bits of basing and various details! I love that we got the precursor to the Blight Drones. Overall these look great, I like the dark, dirty tanks next to the brighter infantry. "Are we going to scrap about it now. Argue which Legion is the toughest?" "The answer always is, the Wolves of Fenris," Torgadon put in. "Because they're clinically insane." -1st Captain Sigismund of the Imperial Fists and Captain of the Luna Wolves 2nd Company. Indeed, the big gritty tanks are truly a fantastic contrast to the brighter legions of mechanical infantry. I can't even imagine what the "full army" shot is going to look like for this massive force!